In the late 90s, my laptop was destroyed in a fire. 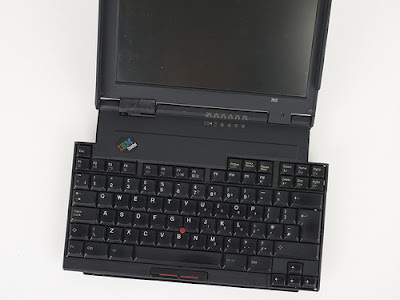 I loved that laptop (an old IBM Thinkpad with a butterfly keyboard, see inset photo) but the big loss was the data -- including the manuscript of a book that had taken me many months to write. I had backups for all of the chapters on 3.5" floppies, but some of those were destroyed as well. I took the charred laptop down to the local IBM service center and they actually cut out the hard drive and hooked it up to a new machine, but the heat damage to the cable and connectors was too much. I lost about eight chapters. It was a hard lesson. Now it's possible to perform DIY hard drive recovery or get pros to do it for you. I've never tried any of these methods, however, and there is a cost attached. Since the fire, I have used a variety of methods to back up my data. Emailing myself copies of important files was simple, but very hard to manage. I have also used external hard drives (including one that I keep in a fire-proof safe) but there is a cost and management overhead. There is also a niggling worry -- what if the backups are lost or stolen as well? Now, I use Dropbox for all of my writing, and for many other backup purposes as well -- photos, business documents, shared work projects, etc. What is Dropbox? As I explain in my book, Dropbox In 30 Minutes, Dropbox is an online storage utility that is simple to use, and makes remote backups that are very easy to recover. The free version comes with 2GB of space, which is more than enough for most writers (you can also expand this to 18GB through various means). I describe how to set up and optimize Dropbox in my book, which includes everything from installation instructions to a FAQ. Read the table of contents to learn more, or search for Dropbox In 30 Minutes in the Kindle and Nook stores. Photo: Flickr/renaissancechambara via renaissancechambara's blog, Creative Commons license. I will review and approve comments as soon as possible, but spam, personal attacks, and rude messages will be deleted. The Lean Media framework can give creators an edge. It's worked for The Simpsons, Minecraft, Led Zeppelin and many others, ranging from solo creators to superstars. What happened to LendInk? The owner responds. Amazon cracking down on newsletter recommendation services? What do Amazon Music family subscriptions and cat trees have in common? Copyright Ian Lamont, All Rights Reserved. Some photos Creative Commons; check attribution on posts. Simple theme. Powered by Blogger.